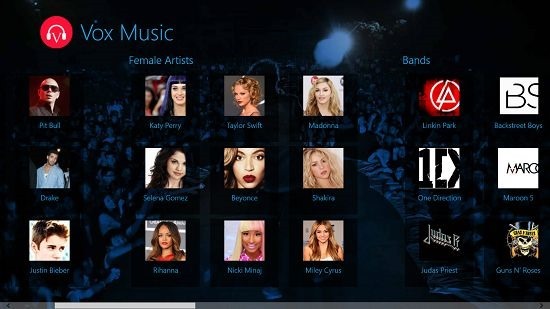 Vox Music is another free app for Windows 8 and 8.1 which allows you to watch music videos from world’s top music artists. When you will launch the app, you will be taken to a selection screen where you can easily choose which artist’s music you want to listen to by clicking on his or her name. 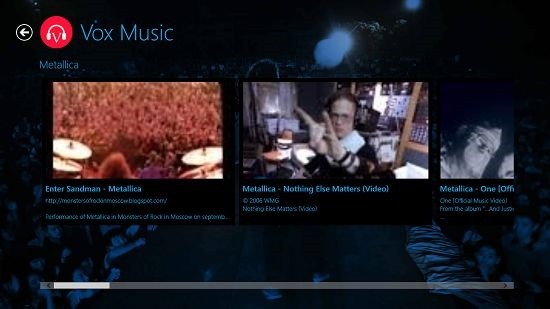 You can also watch music videos from various rock, metal, grunge etc. bands and to do so, all you have to do is to click on the name of the artist and select the track that you wish to play. The app supports multitasking as well by virtue of snapped mode. Vox Music can be grabbed off the Windows 8 App Store for free. Vox Music has an interface which is very pleasing to the eye. With a cool background, this makes for a relaxing feel to the eye. The interface of the app can be seen in the below screenshot. In the above screen, you can see the various male and female artists, and if you scroll to the right, you’ll also be able to see the popular bands which people listen to. All these lists are scrollable and though you can see only about 9 of the artists and bands on the screen at one go, if you hover over a particular category and scroll, you’ll notice that there are a lot more artists in the app than actually meets the eye. When you have clicked on a particular artist, you’ll be able to see their tracks. This again is a scrollable interface from where you can click on a track to start its playback. The tracks are played from online streaming services, and hence you don’t have to worry about losing your precious disk space. 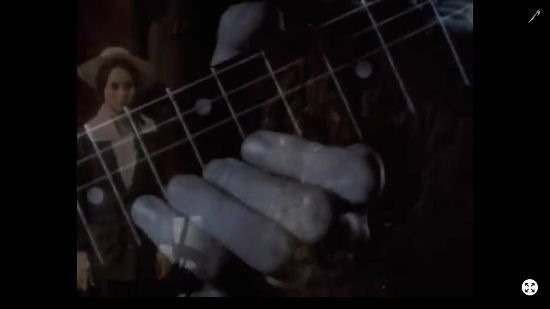 You can see the music video being played back in full screen in the screenshot below. You can switch to windowed mode by pressing the white resize button located at the bottom right of the screen. If you hover over the video being played back, you’ll be able to see the playback controls for the video. You can also switch to a snapped mode for multitasking as well! This sums up the main features of Vox Music. Vox Music is a well designed music video app for Windows 8 and 8.1 which allows you to watch music videos from a ton of artists for absolutely free at no extra cost. The app also supports multitasking and there is basically nothing that I dislike about this app. My rating – 4.5 out of 5!